Llegó la primavera y el amor! I love spring time! I love the weather and to be able to witness nature yawning back to life. How beautiful! When I walk in the mornings or when I go out and feed the pack of (former) stray cats in my backyard, I am welcomed by a flourish of colorful and aromatic aliveness. Bouganvillia and morning glory blooming, jasmines of all types sharing their equisite aroma… And my favorite: yes, the loyal dandelions. Most people want to kill them, because they feel they are “weeds,” but I love to forage them because they are locally and seasonally grown and they are FREE!!!! And, of course, they have amazing medicinal properties. So, I invite you to try these amazing plants. How can we eat them? Well, I make the most delicious salad; simple, tasty and stimulating. Enjoy! Dressing: olive oil, raw apple cider vinegar and 1 tbsp. amino acids (Braggs) made with fermented soy beans. This entry was posted in cleanses, food as medicine, food justice, gluten-free, healthy living, Los Angeles, personal growth, plant based diet, raw entrées and desserts, raw food, sugar-free on April 22, 2013 by Sirena. Filter the water used to soak the dry fruits and dates and keep it. Process the fruit and dates in the Cuisinart and place in a bowl. Frind the flax seeds and the oat groats and add to the bowl. Mix well, using the water used for soaking the fruits. Add chopped nuts, shredded coconut and the agave. Continue to blend and add the water as needed. The consistency should be firm, in order to shape the cookies. You can bake them in the oven at 400 degrees for 45 minutes or dehydrate for 24 hours. Enjoy! * thank you, Lorena, for your comment. Oats don’t have gluten naturally, but many times they are packed in facilities that handle other grains with gluten. Make sure to use uncontaminated oats to prepare this recipe. 2 tazas de frutas secas variadas remojadas en agua filtrada por 4-6 horas. 1 taza de dátiles sin carozo remojadas en agua filtrada por 4-6 horas. Filtre el agua que se usó para remojar las frutas secas y los dátiles y guárdela. Ponga las frutas y los dátiles en una procesadora y procese bien y pase a un bol. Muela las semillas de linaza y los granos de avena y agregue al bol. Mezcle bien usando el agua del remojo. Agregue las nueces picadas, el coco rallado y el agave. Siga mezclando y agregue agua cuando la necesite. La consistencia debe ser firme, para formar copos en la asadera. Aceite la asadera y ponga la masa en copos para hacer las galletas. Cocine en horno de 400 grados por 45 minutos. * Gracias, Lorena, por tu comentario. Si bien la avena no tiene gluten naturalmente, muchas veces se empaqueta en establecimientos con otros granos que sí lo tienen. Para asegurarse de que la receta no tiene gluten, por favor, asegúrense de que la avena no ha sido contaminada. This entry was posted in gluten-free, healthy living, Los Angeles, personal growth, plant based diet, raw entrées and desserts, raw food, sugar-free on April 14, 2013 by Sirena. Thinly slice or chop the onions. Grind the flax and sunflower seeds and put them in a bowl. Add the rest of the ingredients, including the onions. Mix well with your hands, massaging the mixture. Allow the mix to settle for 30 minutes. You will need a dehydrator for this. (Or you could put the batter in a crock-pot or the oven at a very low temperature). Spread the mix on the Teflex sheets of the dehydrator and dehydrate for 24 hours at 105 degrees, then take out the Teflex sheets and flip over the bread and dehydrate for another 12 hours. 1 cup raw almonds/cashews or sun flower/pumpkin seeds– soaked overnight with filtered water. Add ½ cup rejuvelac (or less) to promote the fermentation of the “cheese” and blend. 1 tbsp. amino acids (Braggs) made with fermented soy beans, raw apple cider vinegar. Process dates and mix with hemp seeds and cover a 8×8 glass plate, spread evenly. Refrigerate. Process or blend liquefied coconut oil and chiles. Add the raw honey and mix. Slowly add the cacao powder and mix until smooth. Pour fudge into glass mix on top of the hemp crust. Chill for 30 minutes. This entry was posted in cleanses, fermented waters and veggies, healthy living, Los Angeles, raw entrées and desserts, raw food and tagged cleanses, detox, food justice, live foods, los angeles, raw food on March 4, 2013 by Sirena. 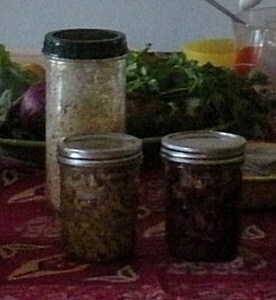 Fermenting: fermented foods help restore the good bacteria in our digestive system. They are natural pro-biotics, and all cultures do have some kind of fermented or cultured foods (curtido, sauerkraut, ceviche, tepache). Grate all the ingredients and put in a bowl. Add lemon juice and salt and mix well. Place ingredients in a glass mason jar. Push until tight and cover with a cabbage leaf and then a kitchen towel. Leave at room temperature to ferment overnight. For a deeper fermentation, leave outside the fridge for one/two days, depending on temperature. After that, regifregerate. It will keep for a couple of weeks. Great to add to a salad, or to accompany any plate. Mix everything well. Make sure to start with the grated coliflor and put the lemon juice right away, so it starts to “cook”. You can serve it with tostadas with guacamole made with ripe tomatoes and chipotle veganaise. La comida fermentada es importantísima para activar nuestro sistema digestivo: como con la fermentación se han cultivado bacterias que ayudan la digestión, todo lo fermentado trae compuestos encimáticos que son muy útiles para nuestro cuerpo. Mezclar todo y asegurarse de que la coliflor sea lo primero que se ralle, y reciba el jugo del limón inmediatamente, así comienza a “cocinarse.” Se puede servir con tostada untadas con guacamole hecho con tomates y Veganaise de Chipotle. This entry was posted in cleanses, fermented waters and veggies, food justice, healthy living, Los Angeles, raw entrées and desserts, raw food on February 24, 2013 by Sirena.